What is a Precision Voltage Reference? The figure below shows a precision voltage reference used in an ADC application. Why Should I Use a Precision Voltage Reference? An Analog–to–Digital Converter's (ADC's) performance is affected by the voltage reference as the ADC Code is inversely proportional to the voltage reference. Certain Analog-to-Digital converters may also have other reference requirements including transient response, DC current requirements, startup timing, or capacitive loading so it is important to test a voltage reference with the specific ADC to be used in an application. Using a voltage reference with tight initial error can help eliminate room-temperature systems calibration. 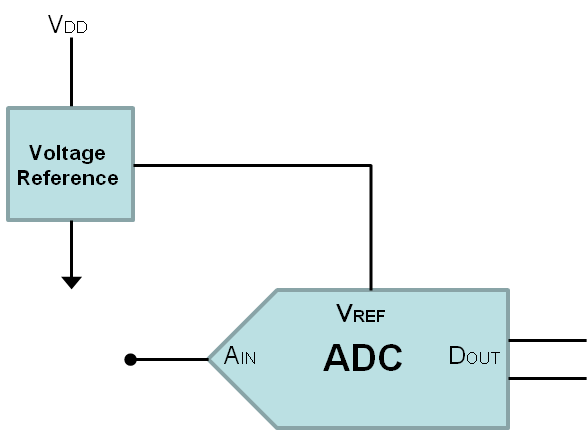 Voltage reference performance affects an ADC’s overall accuracy. Output noise should be smaller than the least significant bit (LSB) voltage (the minimum change in voltage that causes a change in the output code) to maintain converter signal-to-noise ratio. In many cases, it is possible to reduce the effective reference noise by including an RC filter between the reference and ADC and/or adding a buffer between the two chips. The LSB for a 16-bit ADC with VREF = 4.096 V is 62.5 µV. The LSB for a 12-bit ADC with VREF = 4.096 V.
The associated figure shows a basic MCP1501 circuit configuration. The input voltage is connected to the device at the VIN input, with an optional 2.2 μF ceramic capacitor. This capacitor would be required if the input voltage has excess noise. A 2.2 μF capacitor would reject input voltage noise at approximately 1 to 2 MHz. Noise below this frequency will be amply rejected by the input voltage rejection of the voltage reference. Noise at frequencies above 2 MHz will be beyond the bandwidth of the voltage reference and consequently not transmitted from the input pin through the device to the output.